We are all familiar with the beautiful Holiday Barbies by Mattel, but have you seen the lovely Easter Barbie Dolls? Choose your favorite Easter Barbie doll from a wide selection. Some are dressed in pretty little Easter dresses, some are dressed in Capri pants and of course, a Barbie in an elegant spring bouquet gown is also featured. These spring beauties with their little bunnies, baskets or flowers are simply adorable. This lovely parade of barbies is certain to brighten your day! These Barbie Dolls would make wonderful treats for any little “bunny rabbit.” I bet we all have a special little girl in our lives who would enjoy getting one of these adorable Barbie Dolls. Why not get one or two for yourself and start your own Easter Barbie collection this year? Easter Basket BARBIE DollAs you can see above, there really are a lot of Easter Barbies available. All dressed in their pretty spring colors and ready to celebrate Easter with your child. As promised, there is a beautiful Barbie in a long spring gown, as well as a Barbie sporting an Easter bonnet. Perhaps you would prefer the Barbie and Kelly gift set. 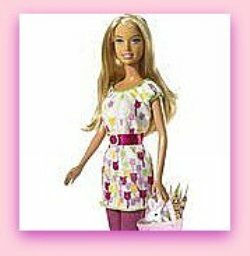 Barbie is dressed in such a lovely dress and ready to take Kelly, dressed as a little Easter bunny, Easter egg hunting. Either of these Easter Barbie dolls would be an awesome Easter gift when given alone or when they are included in an Easter Basket full of goodies. Another Barbie that would be the perfect addition to an Easter Basket or a fabulous stand alone gift. You can purchase this ready made basket or you could select several items above and fill your own basket. Barbie would be way better than all those sugar treats for Easter!